Great Body Percussion Songs give you fast and friendly ways into great classroom singing - just pop them up on your whiteboard and all join in. The pack contains six great songs with body percussion for top primary. Includes beat boxing, vocal tricks, clapping, stamping, clicking, tapping... A feast of physically co-ordinated fun. The CD-ROM's pop up files of lyrics and embedded audio make it easy to teach songs whether you read music or not - and there are demonstration movies plus slide shows of great images to make your performances truly spectacular. 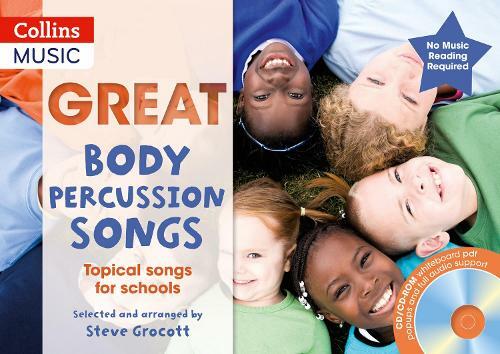 Lesson plans, piano accompaniments, melody lines and second parts - plus a conventional CD recording - Great Body Percussion Songs just go on getting greater and greater.